Recent studies from the laboratory of Majlinda Lako (Newcastle University, UK) have uncovered how the stage-specific modulation of specific signaling pathways contributes to the initiation, maturation, and stabilization of pluripotency induction during the reprogramming of somatic cells, such as human fibroblasts, into induced pluripotent stem cells (hiPSCs) [1, 2] (See the STEM CELLS study here!). The team returns with a new STEM CELLS study employing a high-throughput RNA interference-based screening assay to identify kinase and phosphatase genes that may act as novel activators of the initiation stage of reprogramming. Through analysis of these factors, Neganova et al. now establish the pluripotency-associated gene EDG5 (Endothelial Differentiation G protein-coupled receptor 5 - also known as sphingosine 1-phosphate receptor 2 [S1PR2]) , a G protein-coupled receptor (GPCR) effector, as a critical factor to the maintenance of human embryonic stem cell pluripotency and the successful reprogramming of fibroblasts to hiPSCs . The initial high‐throughput RNAi screening assay of 784 genes belonging to kinase and phosphatase families identified 22 effectors that may represent activators of hiPSC reprogramming. Interestingly, six of the new candidates belonged to the GPCR family (EDG5, GPR42, GPR20, GPR123, GPR116, and GPR37L1) and represented novel regulators of reprogramming. The authors chose to focus on EDG5, due to its high relative expression in pluripotent cells compared to somatic cells, discovering that downregulation of EDG5 negatively influenced the maintenance of pluripotency and mesendodermal gene expression in human embryonic stem cells. 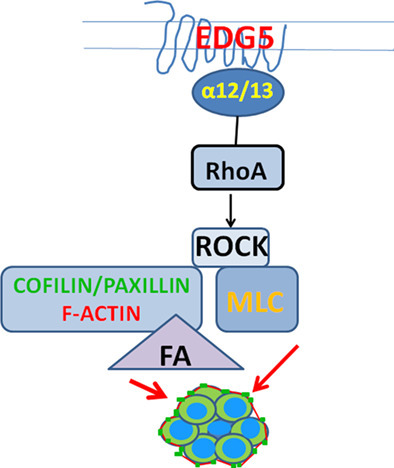 Interestingly, the loss of pluripotent characteristics after EDG5 loss coincided with the loss of actin cytoskeleton organization, colony integrity, and focal adhesions and the acquisition of filopodia in human embryonic stem cells, thanks to alterations in the RhoA‐ROCK‐Cofilin‐Paxillin‐actin and Rho-ROCK-p-MLC2 signaling pathways. As expected from these data, downregulation of EDG5 during the initiation stage of hiPSC reprogramming also produced a negative impact. EDG5 loss prompted alterations to the cytoskeleton, the loss of hiPSC colony integrity, z significant reduction in the number of partially and fully reprogrammed cells, and a decrease in the number of alkaline phosphatase-positive colonies at the end of the reprogramming process. Overall, these data establish GPCR effectors (and EDG5 in particular) as essential contributors to the attainment and maintenance of the pluripotent state and potentially appealing targets for the accelerated production of fully reprogrammed high yield hiPSCs. For more on the identification of novel pluripotency-associated factors and activators of the initiation stage of hiPSC reprogramming, stay tuned to the Stem Cells Portal! Neganova I, Chichagova V, Armstrong L, et al., A critical role for p38MAPK signalling pathway during reprogramming of human fibroblasts to iPSCs. Scientific Reports 2017;7:41693. Neganova I, Shmeleva E, Munkley J, et al., JNK/SAPK Signaling Is Essential for Efficient Reprogramming of Human Fibroblasts to Induced Pluripotent Stem Cells. STEM CELLS 2016;34:1198-1212. Pells S, Koutsouraki E, Morfopoulou S, et al., Novel Human Embryonic Stem Cell Regulators Identified by Conserved and Distinct CpG Island Methylation State. PLoS One 2015;10:e0131102. Neganova I, Cotts L, Banks P, et al., Endothelial Differentiation G Protein-Coupled Receptor 5 Plays an Important Role in Induction and Maintenance of Pluripotency. STEM CELLS 2019;37:318-331.